Crocs comfort Level 1. 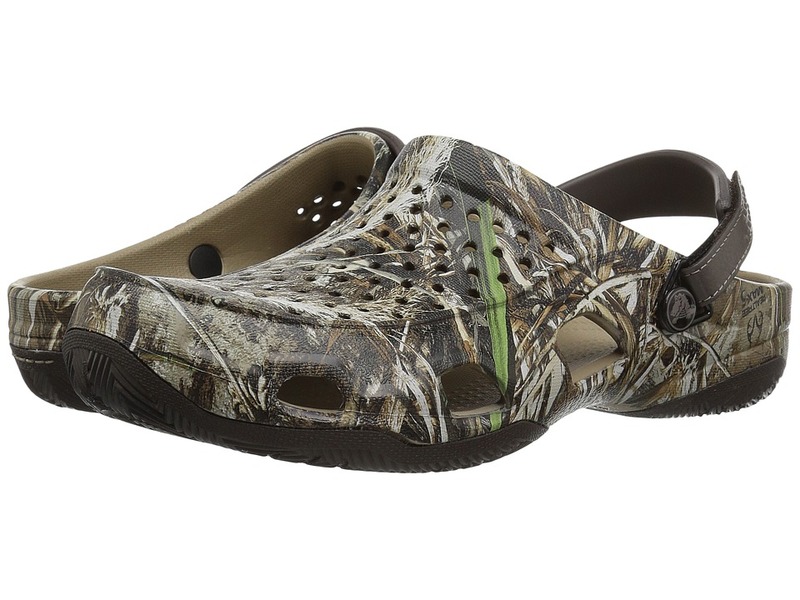 The Crocs Swiftwater Deck Realtree Max-5 is a real water-friendly clog for all of your recreational activities! Croslite upper features the genuine Realtree Max-5 camo pattern. Perforated uppers for maximum breathability. Ports allow air and water to flow through for fast drying. Adjustable heel strap for a comfortable wearing experience. Original Croslite foam cushion: Feels soft with all-day support. Durable rubber outsole. Jordan Outdoor Enterprises, Ltd. - 2006. Imported. Measurements: Weight: 9 oz Product measurements were taken using size 10, width M. Please note that measurements may vary by size. Weight of footwear is based on a single item, not a pair. Brought to you by award-winning actress Drew Barrymore and Crocs. The brand allowed Barrymore to redesign some of Crocs most iconic footwear, re-imagining them to showcase her love of fun and fashion. Upper is constructed of supple Gemlite straps for a comfortable wear. Easy slip-on design with classic clog styling. Adjustable heel-strap secures foot in place. Chevron pattern decorates the upper. Love and gold accented heart charms at forefoot. An arrangement of gold accented beads adorn the straps. Crocs Comfort cushioning provides all-day comfort and support. Molded Croslite foam outsole construction delivers a lightweight feel. Imported. Measurements: Weight: 6 oz Product measurements were taken using size 9, width M. Please note that measurements may vary by size. Weight of footwear is based on a single item, not a pair. Add some iconic retro style to your favorite casual outfit with the Crocband Clog. Thermoplastic (EVA) material construction for maximum lightweight cushioning. Heel strap provides a secure fit every time. Footbed conforms to the heel while circulation nubs stimulate blood flow. Sporty midsole band offers a bold touch of classic appeal. Non-marking outsole delivers traction on a variety of surfaces. Weight of footwear is based on a single item, not a pair. Rock the city look in the CitiLane Roka from Crocs Kids! 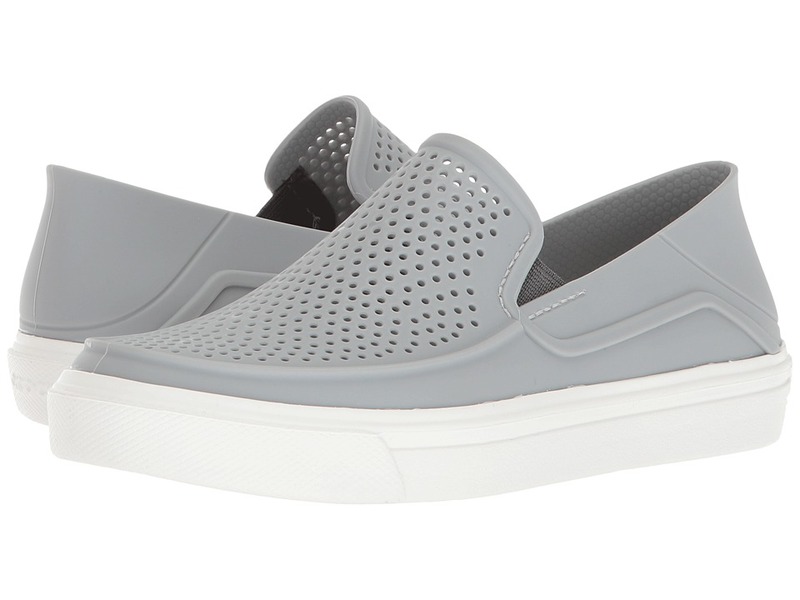 Soft, breathable perforated TPU uppers. Easy slip-on with goring. Croslite foam cushion footbed. Croslite outsole. Imported. Measurements: Weight: 5 oz Product measurements were taken using size 2 Little Kid, width M. Please note that measurements may vary by size. Weight of footwear is based on a single item, not a pair. Enjoy the fun features of the Bistro Graphic Clog by Crocs. Made of Croslite that softens with body heat, allowing shoe to mold to the foot for a customized fit. Heel strap for a more secure fit. Croslite interior. 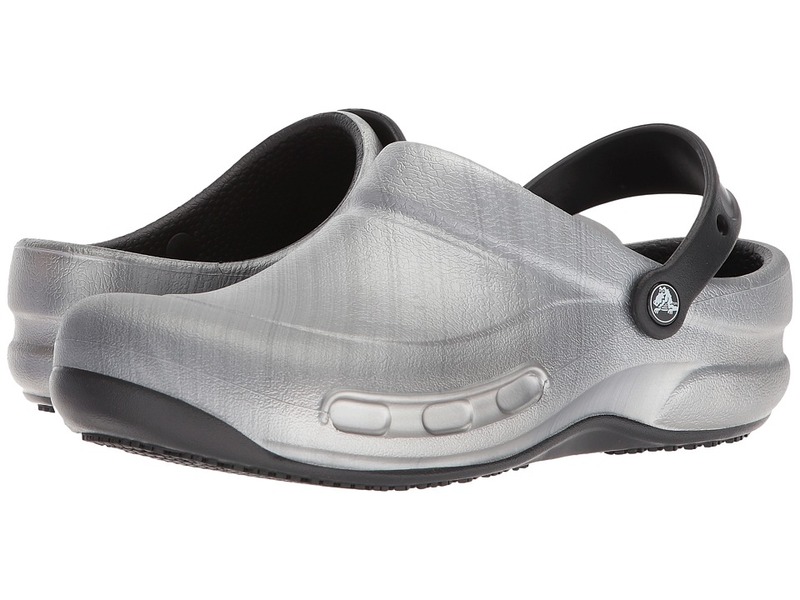 Dual Croslite&amp#8482 footbed is ultra-cushy and extra soft for all-day comfort and support. Imported. Measurements: Weight: 11 oz Product measurements were taken using size Men~s 11, Women~s 13, width Medium. Please note that measurements may vary by size. Weight of footwear is based on a single item, not a pair. Crocs comfort Level 1. 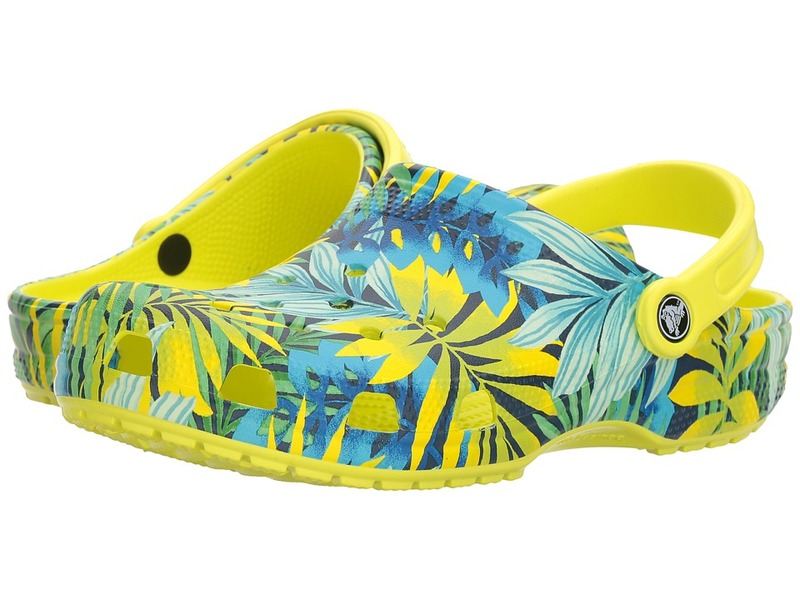 Make a colorful, bold statement with the Classic Graphic Clog from Crocs. Thermoplastic (EVA) foam construction makes them incredibly light. Easy slip-on with adjustable back strap. Extra roomy for a comfortable fit. Ventilation system that allows air and water to pass through multiple ports inside of shoe. 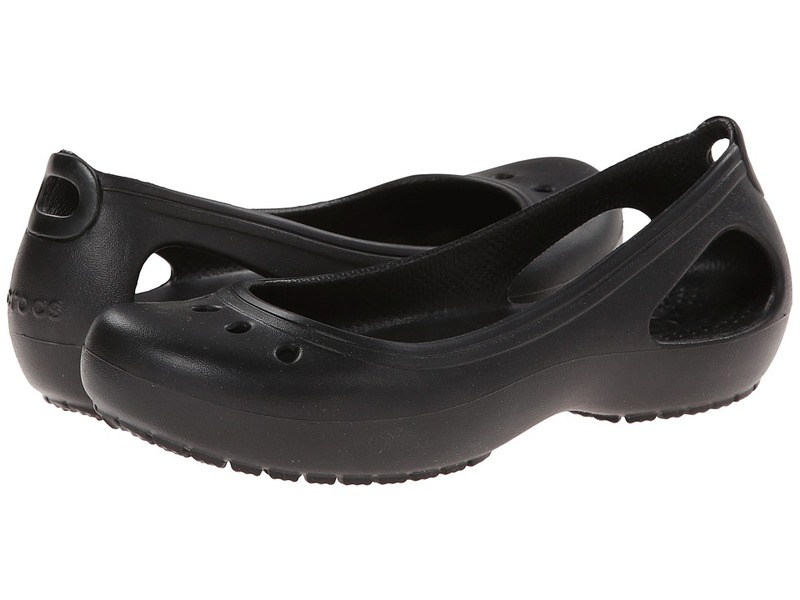 Iconic Crocs Comfort: original foam cushioned footbed. Thermoplastic (EVA) outsole. Imported. Measurements: Weight: 5 oz Product measurements were taken using size Men~s 8, Women~s 10, width Medium. Please note that measurements may vary by size. Weight of footwear is based on a single item, not a pair. Crocs comfort Level 2. 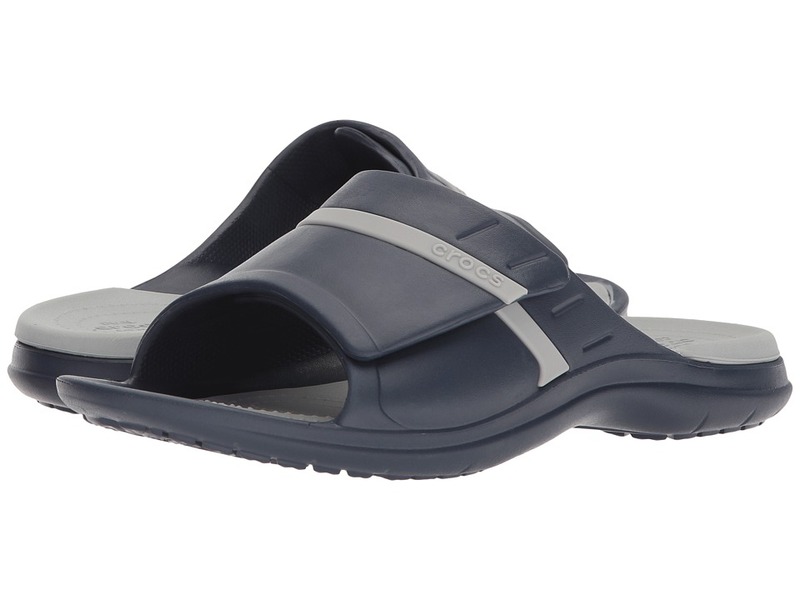 Why pay for a foot massage when you can get one as you cruise around in the MODI Sport Slide by Crocs! Durable Croslite upper. Easy slip-on style with an adjustable hook-and-loop band. Dual density Croslite foam construction for a softer feel and lasting use. Croslite foam footbed on top of a Croslite foam outsole. Imported. Measurements: Weight: 5 oz Product measurements were taken using size Men~s 6, Women~s 8, width Medium. Please note that measurements may vary by size. Weight of footwear is based on a single item, not a pair. Please note this style runs in whole sizes only. For customers that are a half size, the brand recommends ordering a half size smaller than your normal shoe size. Crocs comfort Level 1. Whatever coast you~re on, the Santa Cruz slip-on loafer delivers casual beach style. Lightweight canvas upper with frayed edges. Relaxed fit offers a little more room for your foot. Elastic side goring for a secure fit. Croslite insole conforms to the foot while circulation nubs stimulate blood flow. Slip-resistant and non-marking outsole provides excellent traction for solid footing. Imported. Measurements: Weight: 8 oz Product measurements were taken using size 11, width M. Please note that measurements may vary by size. Weight of footwear is based on a single item, not a pair. Crocs comfort Level 1. 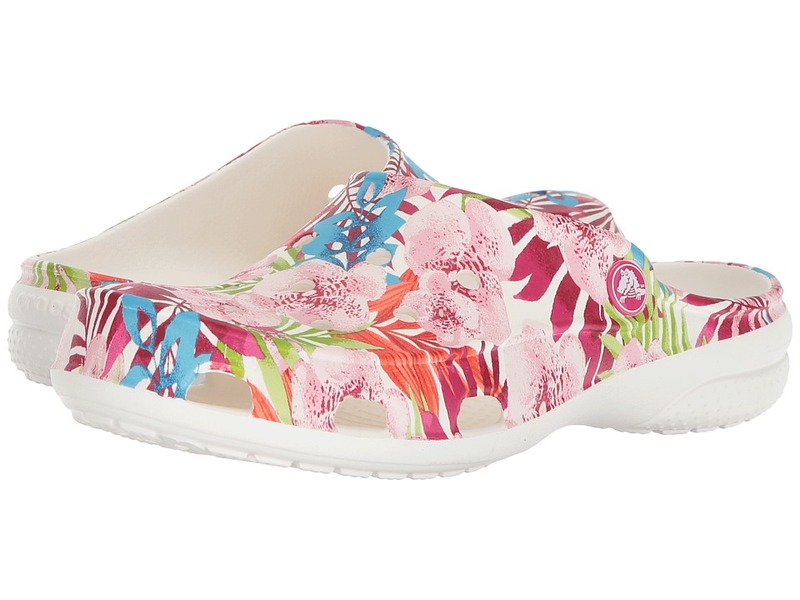 Bring an upbeat vibe to any outfit with the beautiful Freesail Graphic Clog by Crocs. Thermoplastic (EVA) upper features all-over floral print for added fun. Easy slip-on. 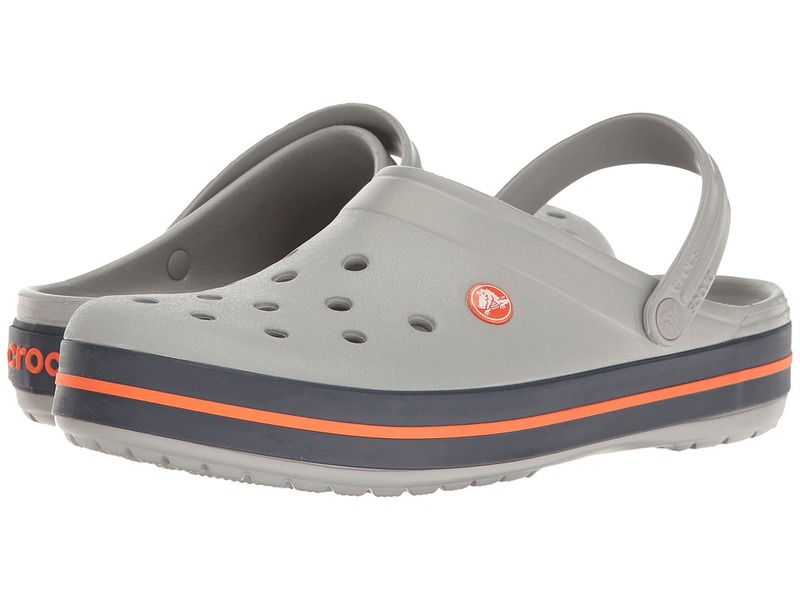 Iconic Crocs Comfort: foam cushioned footbed. Thermoplastic (EVA) outsole. Imported. Measurements: Weight: 4 oz Product measurements were taken using size 8, width M. Please note that measurements may vary by size. Weight of footwear is based on a single item, not a pair. Please note this style runs in whole sizes only. For customers that are a half size, the brand recommends ordering a half size smaller than your normal shoe size. 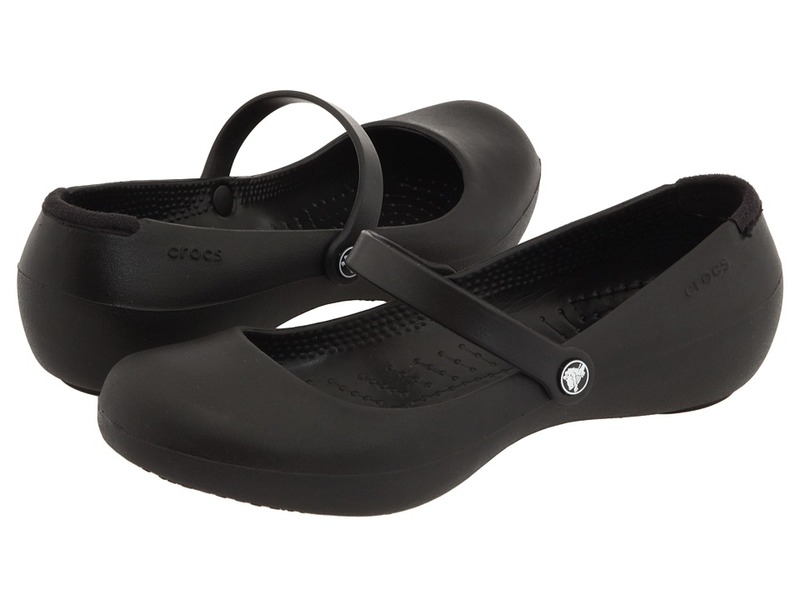 For a casual and comfortable style, you can never go wrong with the Alice Work from Crocs&amp#174. Thermoplastic (EVA) upper with a rounded-toe and mary jane-inspired look. Features a swivel strap for an easy, comfortable fit. Thermoplastic (EVA) material footbed serves a dual function to relieve pressure on feet, legs, and back while increasing blood flow through its use of circulation nubs. Demonstrating slip resistant characteristics for oil, water and soap, the Crocs Lock&amp#8482 tread meets ASTM F1677 standards. Imported. Measurements: Weight: 5 oz Product measurements were taken using size 6, width M. Please note that measurements may vary by size. Weight of footwear is based on a single item, not a pair. Please note this style runs in whole sizes only. For customers that are a half size, the brand recommends ordering a half size smaller than your normal shoe size. 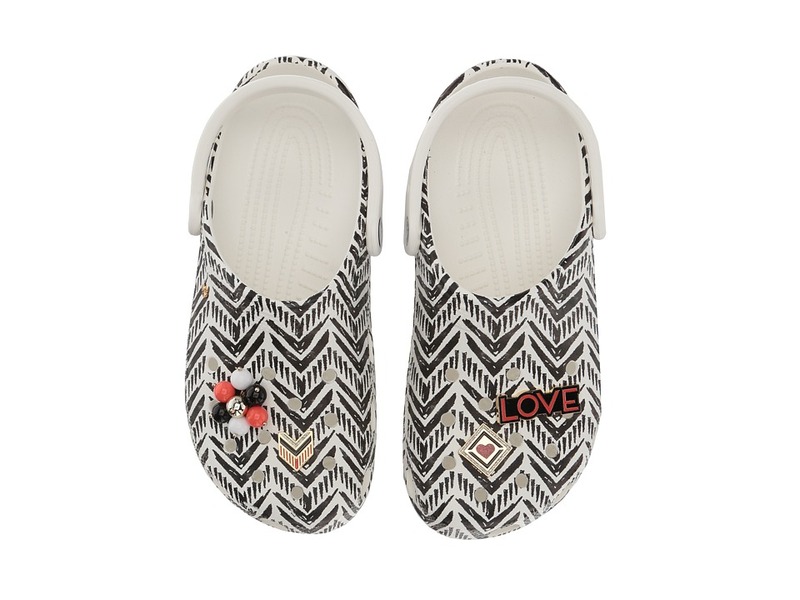 The adorable Kadee Flat from Crocs is an innovative shoe loaded with the renowned comfort that Crocs is famous for. The adorable Kadee flat from Crocs is an innovative shoe loaded with the renowned comfort that Crocs is famous for. Thermoplastic (EVA) upper with feminine details and stylish windows on the heels for added style. Croslite upper with feminine details and stylish windows on the heels for added style. Slip-on construction. 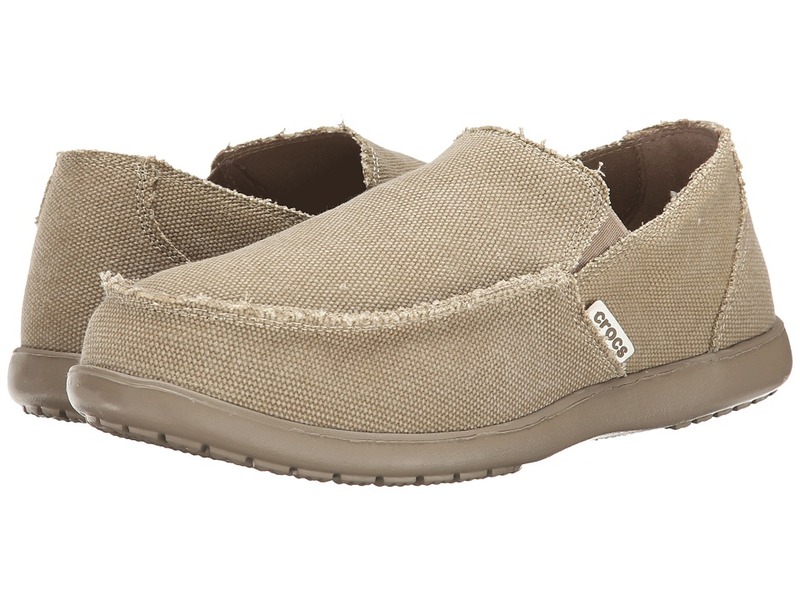 Slip-on construction with Croslite lining that is form-fitting for a snug, comfortable fit. Cushioned footbed serves a dual function to relieve pressure on feet, legs, and back while increasing blood flow through its use of circulation nubs. The Croslite material footbed serves a dual function to relieve pressure on feet, legs and back while increasing blood flow through its use of circulation nubs. Durable EVA outsole. Slip-resistant and non-marking outsole delivers sure footing on a variety of surfaces. Imported. Weight of footwear is based on a single item, not a pair.